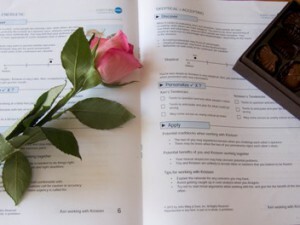 Struggling with conducting a performance review? Not sure how to say what you need to? Knowing your own style as the reviewer will help you to prepare. If you’re a D, you might want to reflect on how to avoid sounding confrontational or abrupt. If you’re an i, you might want to try to be more direct. Often how information is presented is as important as what is presented. If you want a review to be motivational, then knowing the style of the person being reviewed is crucial. You won’t motivate an S by asking her to lead a change management committee. You won’t motivate a C by giving him a generalized positive feedback. You might only know your employee’s style and that gives you a good place to start. You’ll have a good idea about what that person’s priorities are, what motivates him, and what stresses him out. You might know if he is of a similar of different style to others he works with. This provides a bit of context for how you’ll conduct the review. You might also ask your employee if she is comfortable with bringing in her profile to review together. 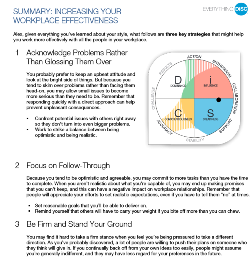 The pages at the end of the Workplace profile give suggestions for increasing one’s workplace effectiveness. Reviewing these can be a comfortable place to start if she’s recently gone through a DiSC training. Reviewing the comparison reports for you and your direct reports together will give you more than an hour’s worth of productive conversation. Most importantly, it can be used to open communication about how to better work with each other. 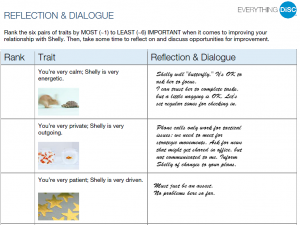 You can respond to what a report says about your differences in temperament or pace, for examples. If you don’t share the same traits, the report gives you a way to speak about them abstractly before you introduce concrete examples. 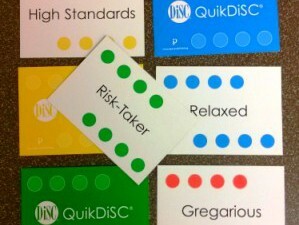 How accurately does the feedback describe the differences in your approach to risk-taking? How do your differences affect your relationship or your ability to work together effectively, and what could you do to make improvements? Are your differences being capitalized upon or are they causing problems? A challenge for this reviewer might be to consider the values of tenacity and questioning new ideas. Are these valuable to the organization? Are challenges to the reviewer’s spontaneous actions being viewed as insubordination or as honest and constructive questioning? Did you list different accomplishments than the review subject did because of your differing values and expectations? Do future goals, objectives or projects listed reflect a desire to stay within a comfort zone related to behavior, or to skill or training? Are you wanting to give a better appraisal than merited because of the “like me” factor? If you look at a sample DiSC Comparison Report, you’ll see that there are sections where the person profiled can personalize the report and describe how she or he can apply the information from the profile. You could discuss these questions during the performance review. Even if you don’t choose to look at your profiles together, you can receive helpful tips for conducting the employee’s review. For example, the report might tell you to avoid dominating discussions and encourage the candid sharing of opinions. Or provide more information about how a newly assigned project will work and what you will see as success. If you have the challenge of reviewing a team that is in conflict, then the comparison reports of the individuals involved can be consulted before the formal review. You will be able to use their differences in preferred behaviors as one filter through which to view the conflict. Even if a team is working together well, the comparison reports or group culture report can reveal the people who might not be as comfortable or as productive as they could be because their DiSC profile differs from that of the group. The group culture report is designed to be used with the entire group, but can also be a useful tool to use with someone whose potential in the group might not be fully realized. 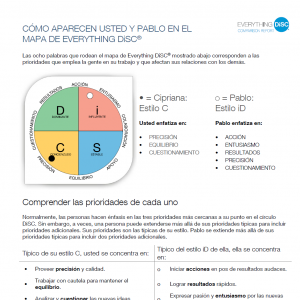 A newer tool that incorporates DiSC with Patrick Lenicioni’s writing about teams is The Five Behaviors of a Cohesive Team. It focuses on the issues of trust, conflict, commitment, accountability and results. If you have more hours to devote to team development, then this product can have a huge impact. 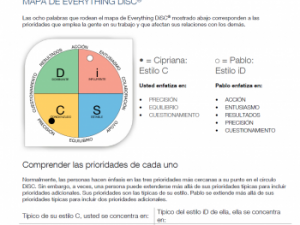 How has knowing your DiSC profile style helped you better communicate with your peers and direct reports? Has it helped you to “manage up”? How have you used Comparison Reports?